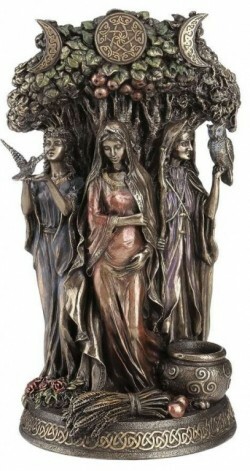 Beautifully detailed figurine of the Triple Goddess, featuring the Maiden, Mother and Crone, each of which symbolizes both a separate stage in the female life cycle and a phase of the Moon. Here the Maiden has a bird in her hand and roses at her feet, the Mother is supporting her unborn baby in her belly with a wheatsheaf at her feet and the Crone has a wise owl perched on her hand with a cauldron at her feet. Each has a different stage of the moon above their head. A fine bronze solid cold cast resin figurine for the home. Felted on the bottom to protect surfaces.